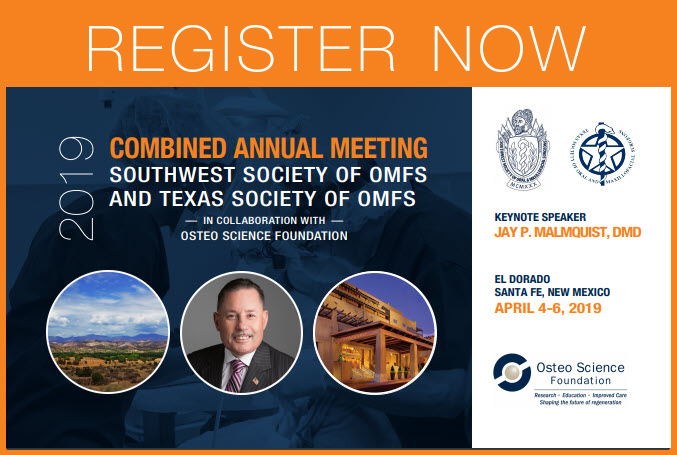 Description: The 2019 Combined Annual Meeting of the Southwest Society of OMS, the Texas Society of OMS, and the Midwestern OMS Chapter in collaboration with Osteo Science Foundation, will be held April 4-6, at the El Dorado Hotel & Spa in beautiful Santa Fe, New Mexico. We are excited to welcome you and your guests to this exuberant, magical city steeped in history and renowned for its Native American and contemporary artisans, culture, and breathtaking scenery. To view the schedule of events and speakers' bios, click here. This discussion will focus on current trends in the bone augmentation for the treatment of patients requiring dental implants. In addition, a systematic review of complications related to bone grafting will be discussed. The benefits of allogenic materials in both hard and soft tissue will be presented. New materials such as 3-D collagen constructs will be introduced. Innovative solutions including the use of blood modifiers and bone proteins will be discussed. The use of the literature to illustrate the outcomes of certain procedures will be discussed. Making choices for certain treatment regimes will be illustrated. This is not the same old lecture but will introduce some new concepts regarding the alveolar network and why it is specifically a biological liability. Review treatment workflows as they relate to esthetic considerations. Jay P. Malmquist, DMD is an Oral and Maxillofacial Surgeon with advanced training and experience with dental implants, bone regeneration, and bone grafting. He is a graduate of the University of Oregon and the University of Oregon Dental School, and completed a rotating internship in the US Army and a residency in Oral and Maxillofacial Surgery at Oregon Health Sciences University. His private practice is in Portland, Oregon. Dr. Malmquist has authored numerous articles and several chapters in textbooks on implants, bone grafting tissue engineering, and bone regeneration. He lectures nationally and internationally on topics of implant placement, bone grafting and various bone proteins and blood modifiers. He pursued extensive research on bone physiology and regeneration at Emory University in Atlanta, Georgia and is now actively engaged in research protocols in the evolution of bone proteins and bone grafting techniques. He is a past affiliate scientist at the Yerkes Primate center in Atlanta, Georga. Dr. Malmquist traveled to Sweden early in his career and trained with the original founder of the concepts of osseointegration and implant reconstruction. Dr. Malmquist is a Diplomate of the American Board of Oral and Maxillofacial Surgery, where he served as an examiner seven years. Dr. Malmquist is a Fellow of the American College of Dentists and the International College of Dentists. He is on the staff at several Portland-area hospitals providing trauma support for maxillofacial injuries. He has shared his knowledge with others as a professor at Oregon Health Science University, contributing to the education of students and residents in the department of Oral and Maxillofacial Surgery. Dr. Malmquist has distinguished himself as the first Treasurer and first President of the American Association of Oral and Maxillofacial Surgeons from the Pacific Northwest. The American Association of Oral and Maxillofacial Surgeons represent more than 8,000 surgeons throughout the United States. He has also been honored with visiting professorships at the University of California, University of Tennessee, University of Nebraska, University of Alabama, University of Indiana and the University of Minnesota. 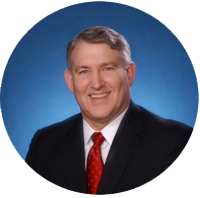 He is a reviewer for several peer-reviewed Journals in implant surgery and is currently the chairman of the Foundation for Oral Rehabilitation; Past Chairman of the Osteo Science Foundation and current President-elect of the Academy of Osseointegration. Office-based dental anesthesia provided by oral and maxillofacial surgeons using the OMS Team Model offers patients a safe, comfortable and predictable surgical outcome. This program will update participants on the latest M&M statistics and discuss ways in which potential complications may be avoided. List four errors in patient selection that can lead to anesthetic complications. Describe six components of a well-structured in situ simulation training program. Discuss six errors made during resuscitation attempts that are most likely to lead to poor outcomes. 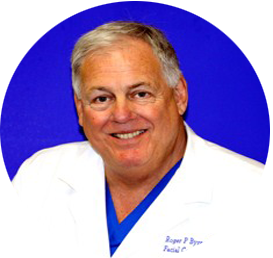 Roger P. Byrne, DDS, MD, has practiced the full-scope of Oral and Maxillofacial Surgery, with an emphasis on office-based anesthesia, removal of third molars, dental implants, and facial cosmetic surgery, in Houston, Texas since 1974. After earning his dental degree from the University of Texas Dental Branch Houston, Dr. Byrne completed his OMS residency at the University of Texas Health Science Center, and earned his medical degree at the Texas Tech University School of Medicine, where he also completed a fellowship in Plastic Surgery at the University’s Department of Surgery, Division of Plastic Surgery. 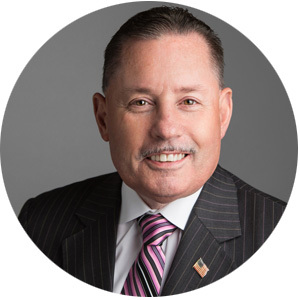 Dr. Byrne is a past president of the Texas State Board of Dental Examiners, the Texas Society of Oral and Maxillofacial Surgeons, and the Southwest Society of Oral and Maxillofacial Surgeons. As a member of the TSBDE, Dr. Byrne helped write the initial law that set standards of care for office-based anesthesia in the dental office. Dr. Byrne has no financial relationships to disclose. David M. Grogan, DDS, MSD, is the Department Chair for Oral & Maxillofacial Surgery at Texas A&M University College of Dentistry. Dr. Grogan earned his DDS, MSD, and completed his OMS residency at Baylor College of Dentistry. Dr. Grogan is a member and former chair of the AAOMS Committee on Anesthesia, and has authored numerous publications on parenteral sedation and office emergency preparedness for Oral and Maxillofacial Surgery practices. Dr. Grogan received the AAOMS Committee Person of the Year award in 2014. He has no financial relationships to disclose. Upon completion of this learning activity, participants will be informed about emerging issues and trends that are impacting the specialty. Additionally, practice management and reimbursement challenges will be discussed along with solutions and examples of how to improve your billing and collections. Information about state and federal issues, including the delivery of anesthesia. will be discussed as will the ongoing trends related to management of acute and post-operative pain. Importantly, information about clinical data registries will also be discussed and examples of data collection to date. 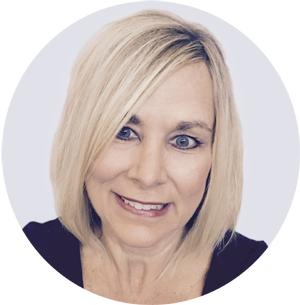 Karen K. Wittich, CAE, is the American Association of Oral and Maxillofacial Surgeons’ Associate Executive Director, Practice Management and Governmental Affairs. Her daily involvement with the members of AAOMS, third party payers, federal and state legislators enables her to actively advocate for and work closely with the Oral and Maxillofacial Surgery community. 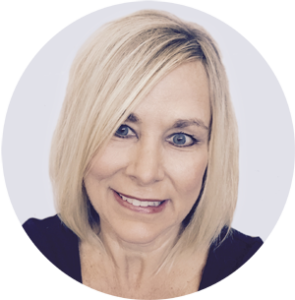 Prior to joining the AAOMS 16 years ago, she was the practice administrator for the OMS ambulatory surgery center. In 2017 Ms. Wittich was elected an Honorary Fellow of the AAOMS in recognition of her outstanding contributions to the specialty, the association, and its fellows and members. Outstanding young oral and maxillofacial surgery residents from the Southwestern and Midwestern regions will present scientific and clinical research initiatives ongoing at their respective institutions of study. Discuss a broad overview of the extensive clinical scope of oral and maxillofacial surgery residency training programs. Inform oral and maxillofacial surgeons in private practice about current advances in treatment modalities, new treatment techniques and procedures, and innovative technological applications that improve patient outcomes. Encourage future oral and maxillofacial surgeons to remain involved in clinical research throughout their careers and to support the expertise and evolution of the specialty. The reservations call center is open seven days a week from 6am to 10pm MST and can be reached toll-free at 1-800-955-4455. Guests calling in may reference either the group name or group code. Room rates are exclusive of state and local taxes. 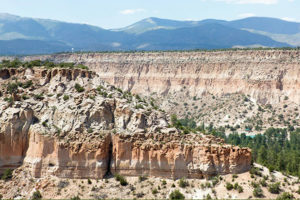 Santa Fe, New Mexico is a magical, exuberant, colorful journey at any time of year, but particularly in the Spring. Nestled against a backdrop of the majestic Sangre de Cristo mountains and the spectacular sunsets over the Jemez range, the effect is magical. The nation’s oldest capital city, Santa Fe is home to artists, chefs, wellness experts, and other creative dreamers, who have brought their culture, talents and experience with them to meld with Santa Fe’s unique blend of Anglo, Spanish and Native Cultures. The early Native American inhabitants called it “Dancing Ground of The Sun”; while the founding frontiersman at the turn of the 20th century referred to it as “The City Different.” Those nicknames still hold true today, as you’ll see for yourself. April daytime temperatures in Santa Fe average about 65 degrees with nighttime lows in the mid-40s. This time of year you may expect 10 hours a day of sunshine. It is suggested that you dress in layers to accommodate the changes in temperature. Dress for the SWSOMS Combined Annual Meeting is Business Casual. 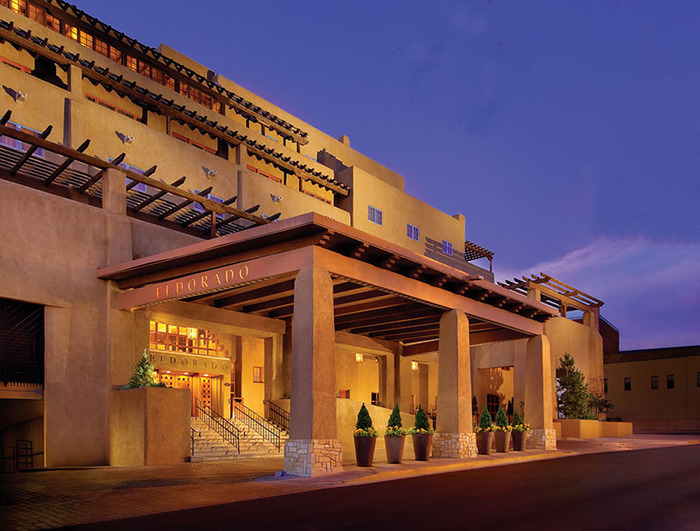 The El Dorado Hotel & Spa is located about 60 minutes from the Albuquerque International Sunport, which sees roughly 340 flights daily on airlines including Alaska Airlines, American Airlines, Delta, Jet Blue, Southwest Airlines and United Airlines. Direct flights are available daily from Dallas, Denver and Phoenix. Located southwest of the city, the Santa Fe Municipal Airport provides commercial airline service by American Eagle Airlines with daily flights to and from Santa Fe and Dallas-Forth Worth and Los Angeles. Commercial service is also offered by United Express with daily service to and from Santa Fe and Denver and Phoenix. Two shuttle services travel between the Albuquerque International Sunport, the Santa Fe Municipal Airport, and the El Dorado Hotel & Spa. The Sandia Shuttle (tel: 505-242-0302 or, toll free, 888-775-5696) and the RoadRunner Shuttle & Charter (tel: 505-424-3367) provide frequent and convenient trips throughout each day between the hotel and airport. Trips cost $33/person one-way to Albuquerque and $16 to the Santa Fe airport. Note: Please allow approximately 1 to 1 ½ hour(s) for travel times to Albuquerque. Shuttles are ready to depart 10 minutes prior to scheduled pick-up times. Rental cars are available from both the Albuquerque and Santa Fe airports. 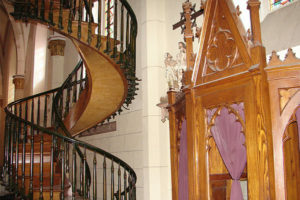 The El Dorado Hotel & Spa is located at 309 West San Francisco Street, Santa Fe, NM. Driving from Albuquerque International Sunport: Take 1-25 north to Santa Fe, and turn off at St. Francis Exit #282. Travel north on St. Francis 3.5 miles: turn right on West Alameda. Turn left on Guadalupe Street. Turn right on West San Francisco Street. 10.5 AACME credits will be provided for full participation in the program. This activity has been planned and implemented in accordance with the accreditation requirements and policies of the Accreditation Council for Continuing Medical Education (ACCME) through the joint providership of PeerPoint Medical Education Institute, LLC and Osteo Science Foundation. The PeerPoint Medical Education Institute, LLC is accredited by the ACCME to provide continuing medical education for physicians. The PeerPoint Medical Education Institute, LLC designates this live activity for a maximum of 10.5 AMA PRA Category 1 Credit(s)™. Physicians should claim only the credit commensurate with the extent of their participation in the activity. 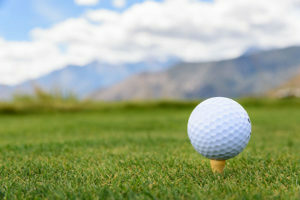 Golf rises to a new level on The Club at Las Campanas’ Jack Nicklaus Signature Golf Courses, consistently rated among the very top courses in New Mexico by Golf Digest. You’ll enjoy the strategic course design and the natural high desert beauty of northern New Mexico enhanced by glorious mountain vistas. We invite you and your guests to an unforgettable evening of dinner and entertainment at the El Dorado Hotel & Spa. Sit back with friends and colleagues and enjoy an evening of fun and relaxation amid the beautiful Santa Fe mountains. Don’t miss this special evening. We’ll begin our adventure at the renowned Santa Fe School of Cooking, where Chef de Cuisine Noe Cano will demonstrate the art of contemporary southwestern cuisine. Founded in 1989, the School’s philosophy is to celebrate local food. The fun continues with a delicious lunch prepared by Chef Noe during our cooking demonstration. After lunch, take some time to peruse the school’s gift shop for cooking tools, cookbooks, pottery, and specialty foods. We’ll conclude our visit with a guided walking tour of the historic Plaza area, visiting such points of interest as St. Francis Cathedral, the Loretto Chapel, with its famous “miraculous” staircase, and the San Miguel Mission. Don’t miss this opportunity to experience the sights, tastes and spirit of historic Santa Fe. Geistlich Biomaterials is proud to sponsor the Osteo Science Foundation Scholarship to provide assistance to OMS residents to attend the 2019 SWSOMS Combined Annual Meeting in Santa Fe, New Mexico. 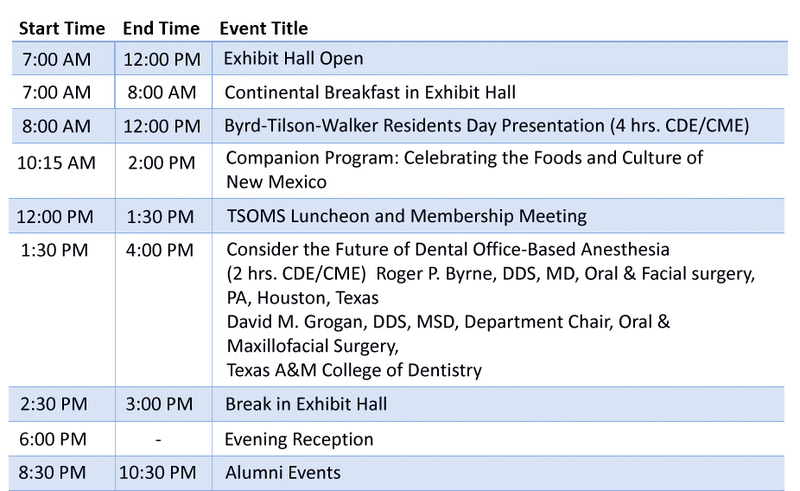 The purpose of the scholarship is to provide financial assistance to OMS residents to attend the SWSOMS Combined Annual Meeting, and provide OMS residents with OMS-related continuing education courses while enabling them to learn more about the practice of Oral and Maxillofacial Surgery. The award will be granted to support 10 residents up to $500 each. 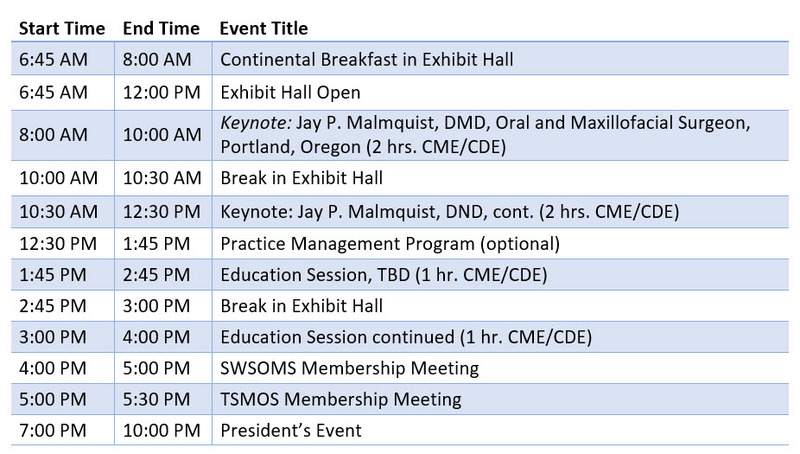 The award monies will be disbursed within 30 days following the conclusion of the 2019 SWSOMS Combined Annual Meeting. Interested residents must complete the award application and return to the SWSOMS by Friday, March 15, 2019. Award recipients will be notified via email on Friday, March 22, 2019.